When we sit with clients and voice our leeriness of having any meaningful exposure to bonds, we can see the confusion in their faces. Investors have been conditioned to believe "bonds are safe." If we limit the discussion to US Treasuries, yes, they are safe. They may fluctuate in value-month to month-but when the bond matures, say, in 10 years, you will be returned what you invested, plus a dividend along the way. However, investing is not that simple. Every month, when a client opens a statement, it's like opening a report card on how they did. The financial service industry has even defined this as "statement shock." So, even a heavily bond-leaning portfolio can see significant drops in value if you are in the middle of a rate-tightening cycle when the Federal Reserve is raising interest rates. Understanding how much price fluctuation you could see in your account is based on the duration of your bond portfolio. 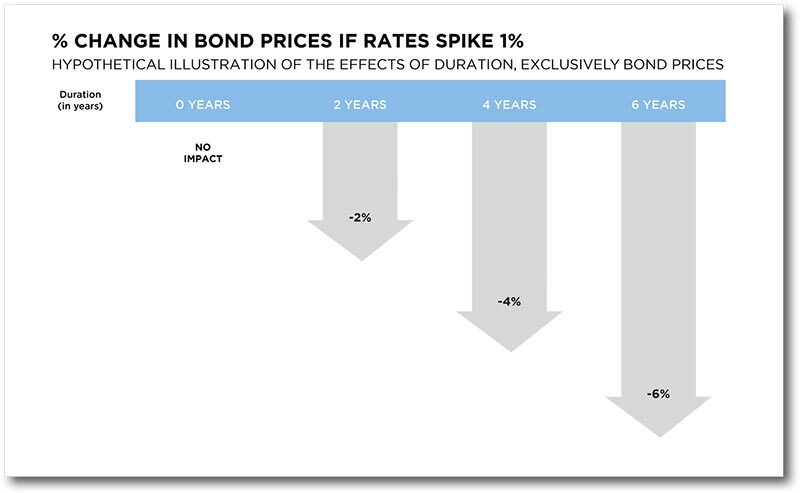 Duration measures the amount to which bond prices likely change with interest-rate shifts. Essentially, duration measures interest-rate risk. To define "duration" and explain its importance to investors, we must begin by understanding how interest rates and bond prices are related. First, keep in mind that bond prices and interest rates move in opposite directions from one another: interest rate increases and traditional bond price declines happen simultaneously. This means that, for example, a bond yielding a 3% interest rate loses market value when interest rates go up. Duration is measured in years: the higher a bond or bond fund's duration is-that is, the longer an investor must wait for it to yield dividends-the lower its price will go with the increase of interest rates. So, in general, for every 1% change in interest rates, a bond's price will move by about 1% in the opposite direction of interest rates for each year of duration. For example, a bond with a five-year duration will experience an approximate 5% price-drop with a 1% interestrate increase, and its price will go up about 5% if interest rates go down 1%. 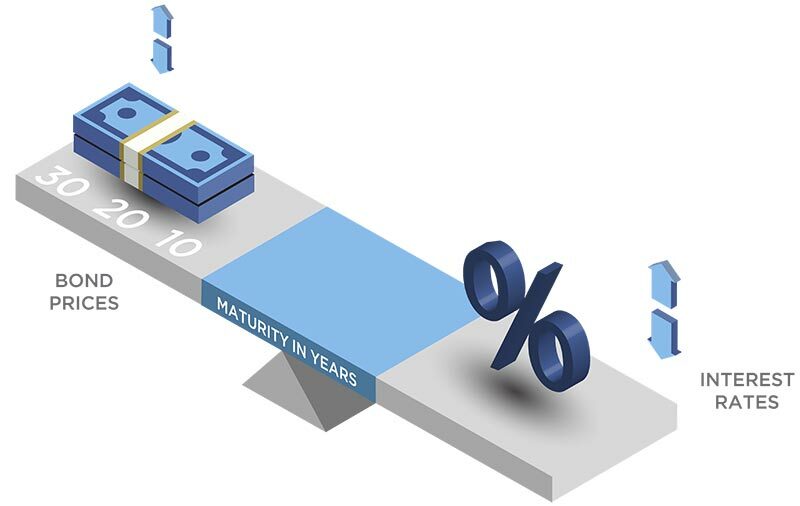 Investors intending to sell their bonds before maturity must especially keep duration in mind. A 10-year $1,000 bond generating 4% interests nets $40 per year and recoups its $1,000 principal if sold after 10 years, regardless of interest-rate patterns. But if the bond is sold before maturity, or if the investor owns a fund that buys and sells bonds during ownership, then interest-rate shifts will affect the bond's selling price. 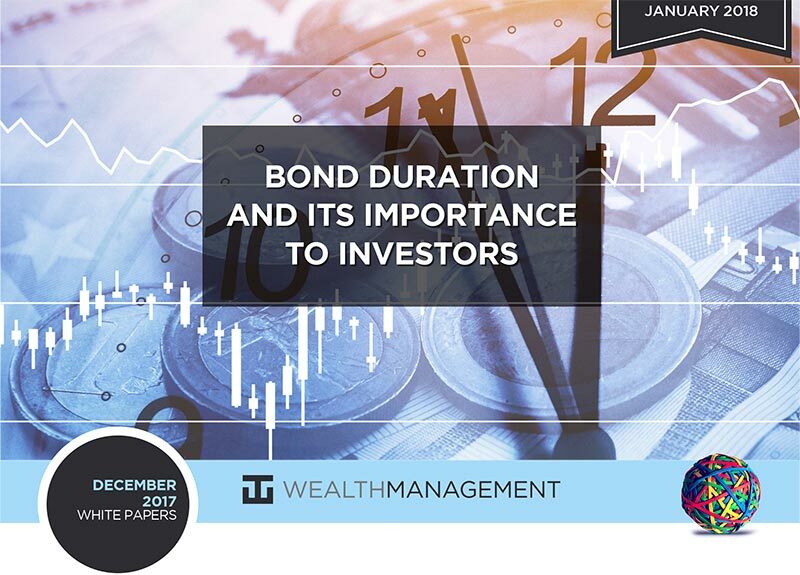 Since each bond and bond fund has duration, those duration numbers are useful for us at WT Wealth Management to compare bond and bond fund options for the investor's portfolio. If, say, we anticipate rate increases, we may encourage shorter-duration bonds with lower interest-rate risk, or bonds that assume different kinds of risks with, again, lower risk of price change from interest-rate fluctuations. Keep in mind that duration is one of several potential effects on bond prices, which is but one reason why it would behoove all investors to collaborate with a financial professional to build a custom portfolio designed to meet personal investment goals. In today's low-yield, low-return investment environment, every dollar counts. Whether retired or investing to build a better future, many investors have been driven to credit, as well as equity strategies with similar characteristics, in a desperate search for income, which could potentially lead them to unintended risks. For instance, a high-yielding equity such as ExxonMobil or a "safe" utility such as Duke Energy will likely be affected by interest-rate increases. The current economic backdrop supports credit investments, but we prefer to take risk in equities. Within the credit markets we advocate an up-in-quality stance. For owners of treasuries and high-quality corporate bonds, we do not advocate exposure to high-yield bonds in a rising-rate environment. We see the Federal Reserve's interest-rate normalization gradually restoring the attractiveness of lower-risk fixed-income sectors, thus reducing investors' temptation to stretch for yield. That is, if the 10-year U.S. Treasury yield climbed to 4%, then many investors may sell their ExxonMobil stock at that point, thus eliminating their market and oil-pricing risk. The present tightness in credit spreads mean market volatility is low, as credit spreads are closely tied with the VIX indicator of U.S. equity market-implied volatility. Your bonds may "seem" safe and attractive when risk-averse, but if the Fed raises rates by 1% over the next year, you may not feel the same way. Searching for yield is a tricky business. We at WT Wealth Management can help you avoid the pitfalls of a rising interest-rate environment. Lean on us to be your shepherd and guardian during the tricky and unsettling times. BlackRock. "What is Bond Duration, and Why does it Matter?" BlackRock, Inc., 2017. Fidelity Learning Center. "Duration: Understanding the Relationship Between Bond Prices and Interest Rates." Fidelity, 2017. Pimco. "Understanding Investing: Duration." Pacific Investment Management Company LLC, 2017. Rosenberg, Jeffrey. "Markets: Beware of Turning Stocks into Bonds." The BlackRock Blog, November 29, 2017. Wells Fargo. "The Relationship Between Bonds and Interest Rates." Wells Fargo Asset Management, 2017. Williams, Rob. "Should You Hold Bonds or Bond Funds When Interest Rates Rise?" Charles Schwab, October 12, 2017. WT Wealth Management is a registered investment adviser in Arizona, California, Nevada, New York and Washington with offices in Scottsdale, AZ Jackson, WY and Las Vegas, NV. WT Wealth Management may only transact business in those states in which it is registered, or qualifies for an exemption or exclusion from registration requirements. Individualized responses to persons that involve either the effecting of transaction in securities, or the rendering of personalized investment advice for compensation, will not be made without registration or exemption. WT Wealth Managements web site is limited to the dissemination of general information pertaining to its advisory services, together with access to additional investment-related information, publications, and links. Accordingly, the publication of WT Wealth Management web site on the Internet should not be construed by any consumer and/or prospective client as WT Wealth Management solicitation to effect, or attempt to effect transactions in securities, or the rendering of personalized investment advice for compensation, over the Internet. Any subsequent, direct communication by WT Wealth Management with a prospective client shall be conducted by a representative that is either registered or qualifies for an exemption or exclusion from registration in the state where the prospective client resides. For information pertaining to the registration status of WT Wealth Management, please contact the state securities regulators for those states in which WT Wealth Management maintains a registration filing. A copy of WT Wealth Management's current written disclosure statement discussing WT Wealth Management's business operations, services, and fees is available at the SEC's investment adviser public information website – www.adviserinfo.sec.gov or from WT Wealth Management upon written request. WT Wealth Management does not make any representations or warranties as to the accuracy, timeliness, suitability, completeness, or relevance of any information prepared by any unaffiliated third party, whether linked to WT Wealth Management's web site or incorporated herein, and takes no responsibility therefor. All such information is provided solely for convenience purposes only and all users thereof should be guided accordingly.